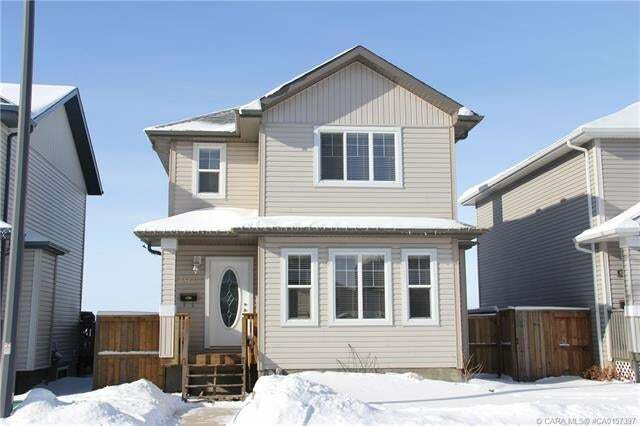 Excellent 3 bedroom, 2 storey home located within walking distance of park and west end shopping! The main floor offers a great living area with gas fireplace, lovely kitchen with white cabinets, corner pantry, Center Island plus all appliances. Bright spacious dining room, 2 pce bathroom and main floor laundry room with cabinets complete this level. Upstairs you will find a large master bedroom with walk-in closet and 4 pce en-suite. Two additional bedrooms and 4 pce bathroom finishes off this section of home. The basement is open for future development and ready for your personal touches. Outside you will appreciate the 22’ x 22’ double garage, great deck with gas hook up and fenced yard. Stop and take a look at this west facing home which backs onto the Alberta Prairies where you are sure to find some peace and quiet.